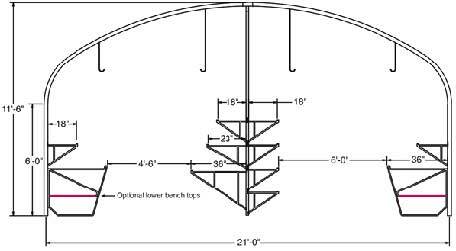 The Garden Mart base package contains integrated side wall and center benching brackets. When combined with our optional galvanized bench top package (standard or expanded metal) you instantly have a greenhouse that is ready to retail. Choose from 2 different center benching styles: flat stacker or tiered. The Garden Mart is available with your choice of Slide-Side ventilation or Roll-up sides making it to keep your customers comfortable and happy in all weather conditions. A wide six-foot opening allows easy access to the Garden Mart for your customers and carts. Covered in durable, twin-wall polycarbonate they stand up to the rigors of a busy retail environment. Garden Mart w/ Slide-Side base package includes: 2” O.D. 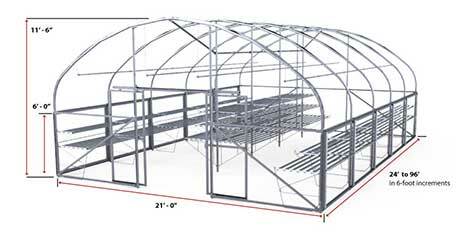 14 ga. galvanized snap-button frame, diagonal wind braces, (4) full-length runs of hanging basket purlin, integrated center & side bench support brackets, Slide-Side ventilation, (1) set of double sliding end doors, ground stakes or water tube hold-down, clear or white single-layer 6mil roof & end wall poly, Wiggle Wire™ poly fastening system, assemble hardware and assembly instructions. Galvanized Standard bench package includes: (2) full-length runs of two-tier galvanized standard bench tops and your choice of flat stacker or tiered center standard bench tops. The center benching allows for a 6-foot walk-around on each end to create a racetrack layout inside the greenhouse. Galvanized Expanded Metal bench package includes: Same layout as the standard bench package but with the upgraded expanded metal bench tops. The expanded metal bench tops are great if you are planning to display small items or hard goods not in trays or flats. Upgrade the whole greenhouse or just a few bench tops to fit your needs.